Sam is a northerner in the south, swapping the streets of Leeds for the beaches of Thanet. He has a lifelong interest in music and musical equipment, regularly playing his 1939 Kalamazoo acoustic guitar and owning a range of analogue and digital synthesizers, including the Yamaha CS-5, DX7 Mk I, FS1R, Nord Lead 1 (MkII) and the Dave Smith Tempest analogue drum machine. His background is in music production, audio-visual technologies and lecture capture, but as an electronic and communications engineer, Sam is capable of repairing, servicing and modding valve and solid state guitar amplifiers, FX pedals and synths. Often found on a bicycle, Sam still isn't sure why he isn't in Kraftwerk. With over twenty years experience of musical instrument maintenance, Gareth is responsible for all guitar & bass setups and drum tuning packages. As a player, examiner and teacher, and with a keen eye (and ear) for detail, Gareth is meticulous in the time he spends setting up guitars and tuning drums. 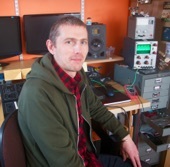 Gareth is also responsible for putting all pedal mods and amplifier repairs through a rigorous performance test process. 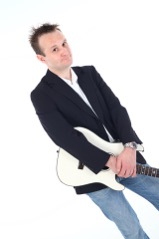 Martyn is a qualified electrical engineer and bedroom guitar player. Working as an X-Ray technician, Martyn repairs and mods guitar amplifiers in his free time. Having serviced most makes of guitar amplifiers, from the Vox AC4 to the Marshall JCM 900, Martyn is capable of fixing numerous issue pertaining to, not just guitar and bass amplifiers, but a wide variety of electronic musical equipment.